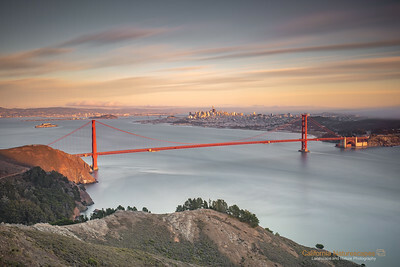 Location: Marin Headlands, San Francisco, California, Map Here is another of my favorite images of iconic Golden Gate bridge. I shot this early in the morning on a day when we had a passing storm in the Bay Area. 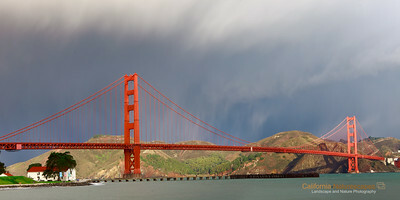 The storm clouds provided perfect backdrop for the bridge and allowed me to capture the image in a good contrast. 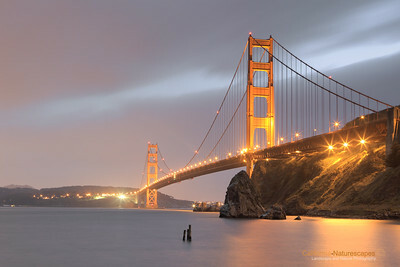 It is always fun to shoot Golden Gate bridge under low lighting conditions of early morning or late evening. The balance of lighting conditions between bridge and it's surroundings is at it's best and makes it possible to capture all the rich hues. Moreover a long exposure in the camera essentially makes the vehicles disappear making it look empty and minimalist. Tech Info: Lens: Canon EF 17-40 f/4L @ 35mm Camera: Canon EOS 5D Mk II Exposure: 76sec at f/13 and ISO 100 Filters: No filters Post Processing: Canon DPP, mainly involving levels and curves to bring out details in shadow areas. 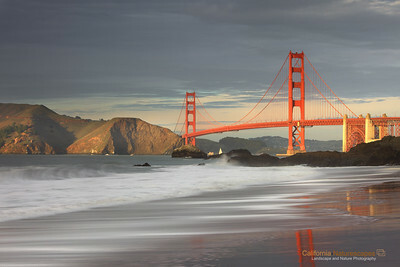 "Winter Light on Golden Gate Bridge" Location: Baker Beach, San Francisco, California. 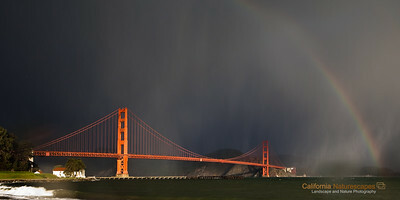 Winter brings with it unique opportunity to see the bridge lit up at sunset against the dark storm clouds. Such light is rare and I could manage to click just a few shots before sun went behind the clouds and all contrast in the scene was lost. Tech Info and Tip: Lens: Canon EF 70-200 f/4L IS @ 78mm Camera: Canon EOS 5D Mk II Exposure: 1.3sec at f/18 and ISO 50 Filters: LEE ND Grads 0.9 soft edge and 0.75 hard edge upside down There is a hill right behind from where I shot this image and the sun goes behind the hill at sunset thus giving a very short time window in which such light can be obtained on the bridge. Location: Crissy Field, San Francisco, California, Map Winter storm conditions bring with them some of the most unique lighting conditions to photograph iconic Golden Gate bridge. On one such evening I was fortunate enough to see this beautiful sunset light on the bridge against backdrop of clouds. It is not an exaggeration that this lighting condition existed for less than a minute before it went gray again. 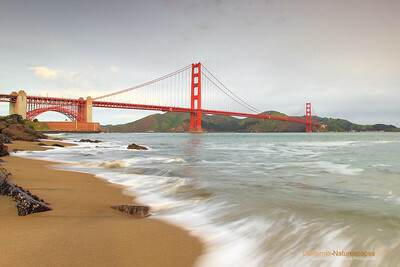 This image was captured at Crissy Field which is a great place to enjoy the waterfront with the cup of coffee. Be sure to visit The Warming Hut while you are here. Tech Info: Lens: Canon EF 17-40mm f/4L @ 25mm Camera: Canon EOS 5D Mk II Exposure: 5sec at f/14 and ISO 50 Filters: LEE ND Grads 0.9 and 0.6 soft edge stacked together Note on post processing: This image is pretty much straight from the camera except for the tilt correction and dust spot removal. I had to make no further changes. The colrs are literally as I saw them. 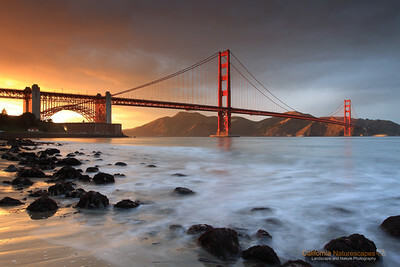 It was truely an amazing sunset at Golden Gate. 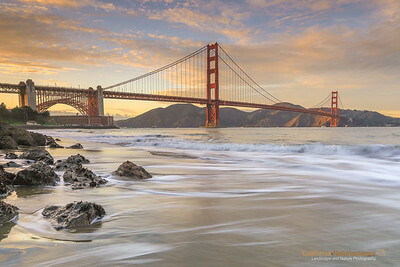 "Golden Gate Bridge" Location: Crissy Field, San Francisco, California. 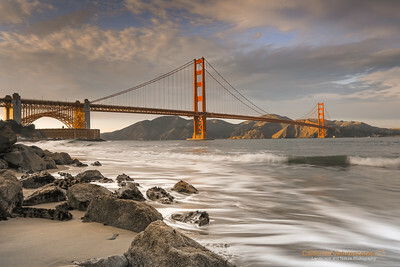 "Sunset Light on Golden Gate" Location: Golden Gate National Recreation Area, San Francisco, California. It was a beautiful day in the bay and yet there was no one on the bridge!... Well, the truth is that I was witnessing one of the best lighting conditions and wanted to make the best of it from a photographic point of view. So using a long exposure time for this image I blurred all the cars on the bridge making it look empty, reduce distractions and thereby emphasize the beauty of the bridge even more. Tech Info and Tip: Lens: Canon 24-70 f/2.8L @54mm Camera: Canon 5D Mk II Exposure: 6sec at f/13 and ISO 50 Filters: 2 stop SinghRay ND grad hard edge The sun is at its northmost location during summer months. This angle of the sun is the best time to obtain light on the bridge you see here. The difficult part is to obtain the clouds to provide a nice background. I was a happy camper after making this image. 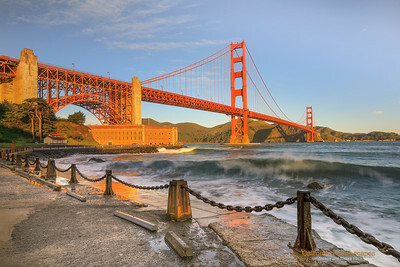 "Winter Light on Golden Gate Bridge" Location: Fort Point, San Francisco, California. The southern setting sun of winter months illuminated the south tower of the iconic Golden Gate as I watched it from atop hills at Fort Point. It was a great evening. Tech Info and Tip: Lens: Canon EF 24-70 f/2.8L @ 27mm Camera: Canon EOS 5D Mk II Exposure: 1.3sec at f/16 and ISO 50 Filters: LEE ND Grads 0.9 soft edge As winter comes to an end the sun will start moving towards north. The next opportunity to obtain a glancing light on Golden Gate will be middle of the summer from its northen end at Marin Headlands. 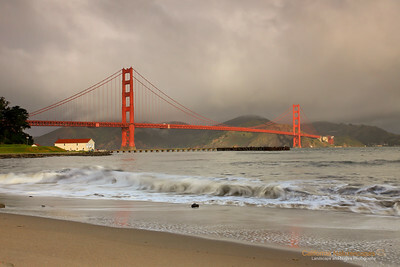 "Golden Gate Bridge and Rain" Location: Crissy Field, San Francisco, California. 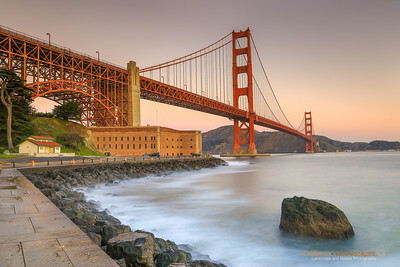 I always like to visit Golden Gate area. It is such an inspiring engineering feat and an aswsome icon by itself. But watching from Crissy Field with the hills Marin Headlands in the background and rain clouds above is just that much more special. The fog like impressions above the bridge is actually rain which had just started before I clicked this image. The long exposure captued the trail of raindrops in the sky and also erased the distractions in water. I liked how it turned out in the end. Tech Info and Tip: Lens: Canon 24-70mm f/2.8L @51mm Camera: Canon 5D Mk II Exposure: 6sec at f/13 and ISO 50 Filters: Circular polarizer The circular polarizer helps darken the sky and bring out the contrast in the scene. 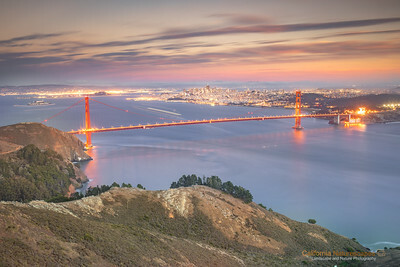 "Golden Gate: Marin Headlands View" Location: Marin Headlands, San Francisco, California. Sometimes during summer months the fog rolls in just thick enough to leave the tip of the south tower of Golden Gate exposed. As I drove on the bridge through the fog I could hardly imagine the view I was about to see from the hill. This evening was very special. Tech Info and Tip: Lens: Canon 24-70mm f/2.8L @42mm Camera: Canon 5D Mk II Exposure: 2.5sec at f/13 and ISO 50 Filters: 2 stop SinghRay ND grad hard edge The presence of high clouds helped a lot to make this image. 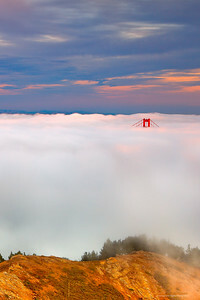 Fog in San Francisco is mostly a summer phenomenon when high clouds are difficult to come by. 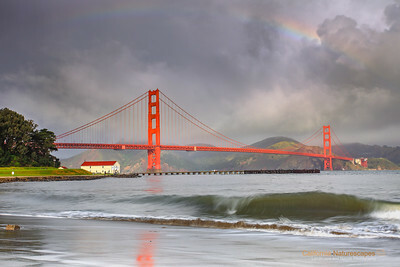 "Golden Gate and Rainbow" Location: Crissy Field, San Francisco, California. It does not rain much in California, but when it does it can sometimes create very unique lighting conditions. 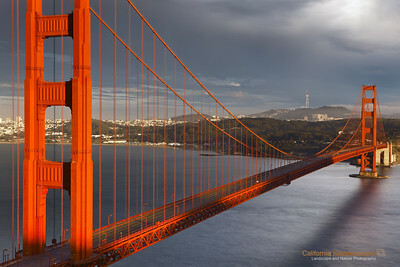 The early morning light on the bridge had wonderful contrast against the dense storm clouds behind the bridge. Adding to the drama the rain had started pouring and even created a rainbow. Soon afterwards the rain caught up to me but I was ready with my rain gear :) Tech Info and Tip: Lens: Canon 24-70mm f/2.8L @24mm Camera: Canon 5D Mk II Exposure: 1/15sec at f/8 and ISO 50 Filters: Circular polarizer The circular polarizer helps darken the sky and bring out the contrast in the scene. Golden Gate is, by no doubt, the most beautiful bridge in the world. No wonder so many people visit San Francisco to see it. 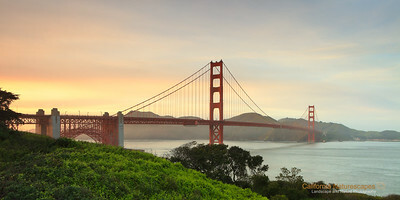 In that sense I feel very lucky that I live in the San Francisco Bay Area and not far from the bridge. 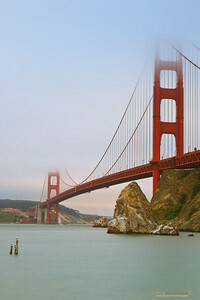 This is the view of the bridge on a foggy evening from the north end at Fort Baker. I used long exposure of camera to smooth the waves in the water and give a minimalist feel to the image. 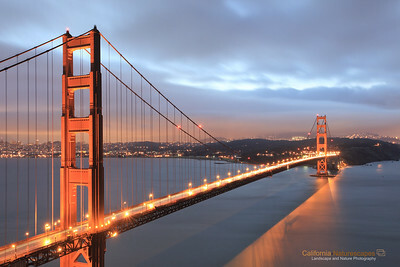 This image prints very well at 24x36in with all the details in the cables of the bridge still sharp.